Is it Better to Rent or Buy a House in Australia? Renting might seem more appealing with soaring housing prices in Sydney and Melbourne but don't expect it to be cheaper than buying. While investors have boosted the supply of rental accommodation and reduced the rate of growth of rents, rents are still growing in the two major cities, Housing Industry Association senior economist, Shane Garrett said. Real Estate Institute of NSW president Malcolm Gunning said in many cases, "mortgage repayments are cheaper than rental". "Take for example a one-bedroom in inner city Sydney which costs about $700,000. At about a 4 per cent fixed mortgage rate, you pay about $580 a week," he said. But rents in these areas are about $650 to $700. Mandy A single 30-year-old renting in Sydney. 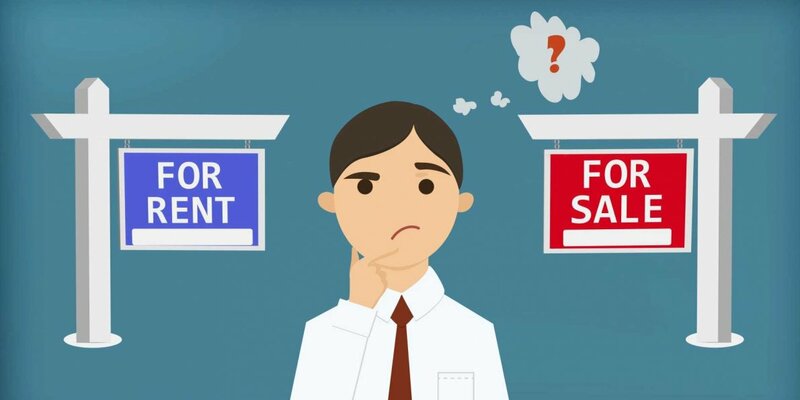 She is weighing up the decision of whether to continue renting or to buy a home which is of the similar value as her current rental property with a $450,000 home loan, for a loan term of 25 years at a 6% p.a. interest rate. Mandy would require a minimum income just shy of $100,000 to buy the property she is renting (assuming her parents went guarantor on a home loan covering the entire cost of the property). So if she didn’t have that income, she could look for a cheaper property, save for a deposit (which would bring her required income down) or continue renting. 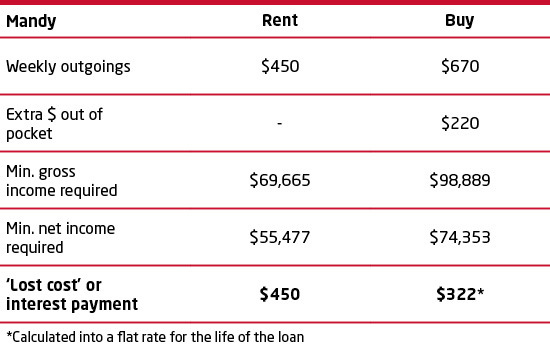 As her scenario demonstrates, the income required to rent her current property is $29,220 less than purchasing it. On the other hand, if she did have the necessary income to purchase the property, she would be paying less in interest per week over the life of the loan than she does currently in rent. The same rent payment put towards her mortgage would build her wealth in terms of equity by $128 per week. So, for Mandy, purchasing the property could be worth it as it’s better value than renting. There are two additional factors which make it even more attractive to buy rather than rent. The first is the impact of the cost of rental price growth versus the fixed initial purchase price of the property and the second is the impact on rising incomes. Firstly, rental prices grow, while a property purchase is fixed in dollar terms from the date of purchase. Repayments on a property get better year to year, as they don’t rise in the way that rents do (leaving interest rates aside). So while many people may, perhaps rightly, be very hesitant to lock themselves into a 25 year mortgage, it’s equivalent to escaping 25 years of annual rent increases. The second factor that improves the case for buying is the impact of salary increases based on inflation. As the years proceed (and if interest rates stay the same), borrowers will be paying less and less of their disposable income towards repaying a home loan — all before career progression and other associated pay rises are taken into account. Whereas for renting, rents tend to rise faster than inflation. Based on these numbers, buying a property to live in is a better pick. Have on Mandy’s choice of buying or renting. By the 10th year, Mandy’s mortgage will be less than it would have cost to continue renting. By the 20th year, rent will be more than double a her mortgage repayments. Over the long run the numbers lean towards buying a home in favor of renting. Not all situations are going to be the same, but buying a home can be a good way of avoiding rental price hikes.